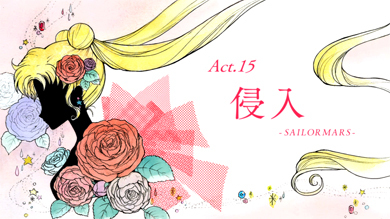 The little girl (also called Usagi) fires the gun at Usagi and flowers come out of it. Usagi faints and the girl runs away. Elsewhere, the new group of villains called the Black Moon scheme. Rubeus sends one of the Spectre Sisters, Koan after Sailor Mars. 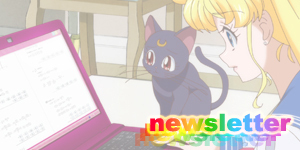 As soon as Usagi wakes up, she and Mamoru track down the mysterious pink-haired Usagi. They find her on a swing in a park. Mamoru offers her his hand and when she grabs it, he sees a vision of a crystal palace. The little Usagi whispers to Mamoru that she did something and that it was her fault. She doesn’t elaborate though and the adult Usagi offers to take her back to her house. When they arrive at Usagi’s home, they’re greeted by Luna, Usagi’s mother (Ikuko), father and brother (Shingo). Usagi’s mother sees Mamoru and kindly asks him what his name is. He begins to reply but the little girl bursts out that her name is Usagi. Ikuko is surprised that she has the same name as her daughter and tells her how cute she is. The little girl suddenly picks up her Luna P ball, transforms it into an umbrella and hypnotises everyone. Luna snaps Usagi and Mamoru out of the trance but everyone else is made to believe that this little girl is a member of their family. Usagi grabs her and takes her to her room for interrogation. Before she can get anything out of her though, Ikuko calls up to Usagi and “Little Usagi” and tells them that dinner is ready. As she leaves, Luna sees what looks like the Legendary Silver Crystal and a key dangle around her neck. She tells Usagi that she doesn’t think the girl is up to anything. 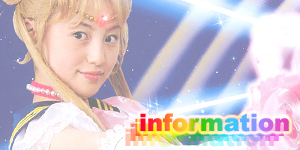 Usagi mentions that she is consciously supressing the crystal’s power and no one should be able to sense it unless she transforms. 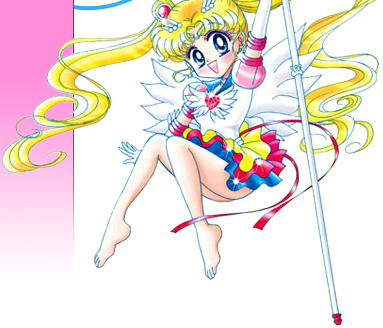 Note: “Little Usagi” is simply a nickname that the characters begin to call the younger, pink-hired Usagi due to her having the same name as Usagi, looking a bit like her and being small. It’s also extremely useful for the audience to differentiate who the characters are talking about and also makes writing episode guides a lot easier. The Japanese used is “Chibi Usa”. It’s just a nickname in the same way Mamoru calls Usagi “Odango Atama” which is translated as “Dumpling Head”, “Bump Head” or the classic “Meatball Head” in the 90s English version. While something like “Little Usagi” or “Mini Usagi” should be used in a good quality English translation, the official Sailor Moon Crystal subtitles have the habit of mixing a lot of Japanese words in with the English even though there are English equivalents. 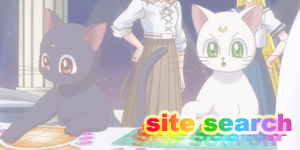 “Chibi Usa” is used in these English subtitles so to avoid confusion I will be using that in these Sailor Moon episode guides when appropriate from now on. The next day, Usagi and Luna meet up with Rei, Ami, Makoto and Minako at Fruits Parlor Crown. Luna gives them all brand new transformation pens and communicators and explains that they’ll be more powerful now due to the rebirth of the Moon Kingdom. A friend of Makoto’s called Asanuma sees them and says hello. Makoto explains that he looks up to Mamoru who is his senior at school. Usagi wonders if Mamoru is really popular. Rei remembers that she has to go to school and help prepare for her school’s festival. She’s going to be doing some fortune telling as part of a fundraiser. When Rei arrives at school, she’s introduced to the Supernatural Research Club and their president, Kotono Sarashina. Kotono tells her about recent UFO sightings in the area and even cases of spontaneous human combustion. As they’re talking, a member runs in and tells them that another club with a similar theme is also doing fundraising. They call themselves “Black Moon”. That night, Rei has a dream of a man being burnt alive by and evil woman (Koan). The following day at school, Rei and Kotono discover a member of Black Moon giving scary fortunes to students such as information on how they will die. They both go to tell the nuns at the school and run into Chibi Usa who had just bumped into them. The nuns have a black moon symbol on their foreheads and are acting strange. As soon as they walk away, Kotono smells something burning. They run after the nuns and see them all burning alive in blue fire. Kotono faints. The evil fortune teller reveals herself to be Koan from Black Moon. Usagi and the others arrive and they all transform. Sailor Mercury attacks Koan and her lackeys with Mercury Aqua Mist, Sailor Jupiter with Supreme Thunder and Sailor Venus with Venus Love Me Chain. All three realise that they’re a lot stronger now than before. 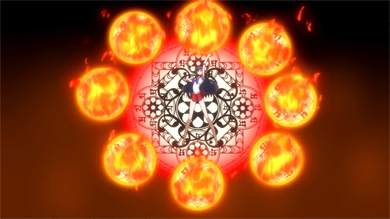 Sailor Mars is furious with Koan for giving fortune tellers a bad name and attacks her with a brand new attack called Burning Mandala. Koan proves to be stronger though and traps her in a prison of blue fire. Sailor Moon tries to free her with Moon Tiara Boomerang as does Sailor Mercury with Shine Aqua Illusion but neither attacks are effective. Koan demands to know where the Legendary Silver Crystal is and attacks Sailor Moon. 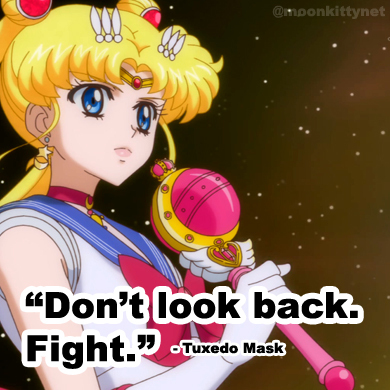 Tuxedo Mask appears and deflects her attack. 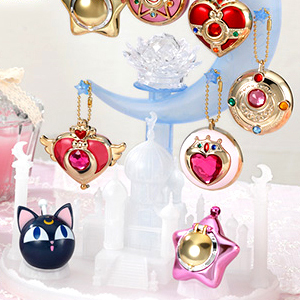 As his hands touch Sailor Moon’s, their hands begin to glow and the Moon Rod appears. Luna recalls that this is the rod that Queen Serenity used to own. 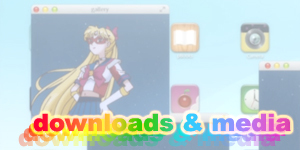 Sailor Moon destroys Koan with her new attack, Moon Princess Halation but Mars remains imprisoned in fire. Rubeus appears and is instructed by Demande to take Mars with him as she may know where the Legendary Silver Crystal is. Rubeus and the captured Mars are drawn into a shining UFO in the sky which flies away as soon as they’re on board. 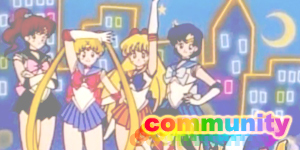 Sailor Moon yells out for Sailor Mars. This episode featured the first appearance of a lot of characters such as all of the Black Moon (Nega Moon in the 90s English version); Wiseman, Prince Demande (Prince Diamond), Safir (Saphire), Emerald and Rubeus as well as their underlings, the Spectre Sisters (Wicked Sisters); Koan (Catzi), Berthier (Birtie), Calaveras (Avery) and Petz (Prizma). A friend of Makoto’s called, Asanuma also appears for the first time in this episode as do several of Rei’s classmates like Kotono Sarashina who’s in charge of the Supernatural Research Club at her school. 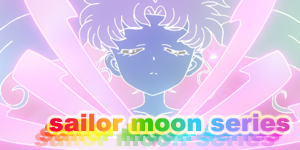 Sailor Mars used Burning Mandala and Sailor Mercury used Shine Aqua Illusion for the first time in this episode. The Sailors got their new communicators and transformation pens in this episode. Luna claims that they’re more powerful due to the revival of the Moon Kingdom. 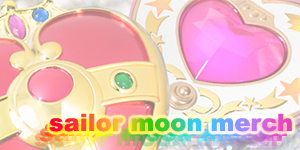 A new opening credits was used in this episode featuring new shots of the Black Moon Family, Sailor Pluto and Chibi Usa (Rini in the 90s English version. Literally “Little Usagi” or “Mini Usagi”.). Several shots were also updated such as the umbrella scene which now has some of the girls wearing new clothes. The girls visited Fruits Parlor Crown (which is also owned by Motoki’s family who owns the Crown Arcade) for the first time in this episode. While there is speculation that Fruits Parlor Crown was named after an Azabu Juban business of the same name, the café seen in this episode of Sailor Moon Crystal looks remarkably like a Tully’s Coffee in Azabu Juban.